The first film in the set would be enough, on its own, to secure Rossellini a place in the cinematic pantheon. In some respects the appropriate comparison for Rome Open City isn't another picture from the Neorealist movement, but is Rashomon�each came from a filmmaker from a vanquished Axis power, established its director as a force to be reckoned with in world cinema, and gave a newfound international credence to the films of their respective countries. And time and place aside, Rossellini and Kurosawa would be recognized as masters, regardless of the particular circumstances of the production of their work. The hallmarks of Neorealism are usually stylistic, and there's no shortage of the signature attributes here�the camera out in the streets rather than on the soundstage, the emphasis on the working classes, the sense of life as a struggle rather than a pomaded parade. But a couple of things are most striking about even the style of Rome Open City, especially its debt to film noir. Rossellini loves investigating the shadows, knows the power of strong women, and has readymade villains at hand in the fey, officious Nazis who terrorize the temporarily vanquished. It's an element of the movement that sometimes gets overlooked, but that is unmistakable, especially in a film like Visconti's Ossessione. This is frankly a morality tale about the resistance, and you sense some defensiveness coming off of the picture�the Italian alliance with Germany earlier in the war is the sin that isn't discussed, but that must be grappled with. There's an almost Capraesque belief in the power of the people, but here without the Hollywood treacle; it goes over well, especially given the last choking fumes of moral degeneracy and Weimar decadence coming off of the Nazis. (Their casual cruelty and specificity with regard to torture techniques makes this seem at times like an eerily prescient Abu Ghraib training film.) Rossellini even keeps his skepticism about the Catholic Church in check�it's a force of good, an institution of forgiveness. And of course there is Anna Magnani, as Pina�she is soulful Italian Method acting incarnate, a performer of unparalleled subtlety and empathy. And she's not interested in looking glamorous, either�I suspect that she herself wouldn't call the work courageous, but to see a performer prepared to bare so much emotion and to forgo all vanity is an extraordinary thing. Peter Bondanella's commentary track is ported over from Criterion's laserdisc release of the title, and he's informative and workmanlike, sometimes uninspired or perhaps simply nervous at being recorded. 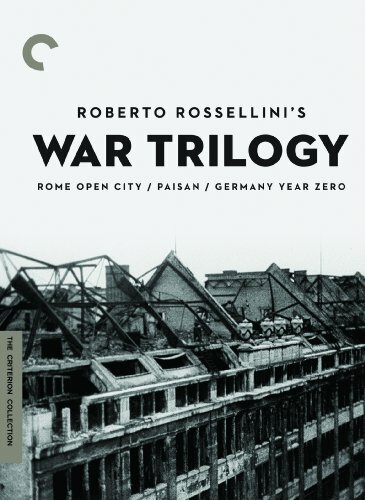 He's excellent on Rossellini in particular and Neorealism in general; he does do a little too much narrating, though. Once Upon a Time (52m:26s) is a 2006 documentary on the making of the picture, with many prominent fans, and family (including the director's daughter Isabella), emphasizing the political content of the movie. Mark Shiel's visual essay Rossellini and the City (25m:05s) goes over all three films in the set; Father Virgilio Fantuzzi reminiscences about his friend Roberto (5m:15s), and Rossellini scholar Adriano Apr�, in a 2009 interview (12m:22s), talks us through the history and evolution of the project. The middle entry, Paisan, is something of a grisly little travelogue, as it travels up the Italian peninsula with the vanquishing American GIs to give us a sense of Italy just after the armistice. It's impossible not to view this first as a sociological or anthropological document; of course Rossellini's craft is at a very high level, and his sentimental streak is on display�he's got an almost tragic sense of fatalism, and a weakness for children, but the sheer horror of the destruction inflicted upon so much of Italy keeps this from ever getting treacly or excessively sentimental. His commitment to Neorealism led him to cast American soldiers�they certainly lend an air of authenticity, but they're all pretty wooden as performers. It's easy to miss the nuance of Magnani and her colleagues from the previous film. The first tale concerns the American invasion of Sicily�a local girl agrees to be the guide for an American platoon looking to weed out the retreating Germans, and she and one of the soldiers, Joe from Jersey, establish a personal connection. Next, an African-American soldier, on leave and loaded, befriends a street urchin Naples�there's the sense that they're both outsiders on the lam, and won't compromise one another. Episode 3 takes us to Rome, with many more drunk American soldiers, lavishing attention on the women of the city, many of whom, in the exigencies of war, turn to the oldest profession�one in particular expresses his love for Francesca, whom he met only fleetingly before the battle, and is likely never to find again. On to Florence for Episode 4, where Harriet, an English nurse at a Red Cross station, carries the torch for an Italian painter from her studies abroad before the hostilities�he's forsaken the canvas for the fight, and she sets out to find him, suggesting that heartbreak is more powerful even than American weaponry. Episode 5 concerns the men of the cloth�three U.S. chaplains seek temporary refuge at a monastery, where they buy good will with Hershey bars. The monks are hospitable, but have a collective crisis when they discover that one of the three is Protestant, and one is Jewish. (It's like the setup for a hoary joke: a priest,a reverend and a rabbi walk into a monastery, and...) And Episode 6 brings us closest to the heat of battle, in which Italians are rescued from a remote outpost as some of their comrades have fatal encounters with the stubborn German enemy. The disc includes an introduction (3m:05s) for the film from the director, filmed in 1963 for French television; another visit with Adriano Apr� (16m:54s) on the genesis of this project; a second visual essay (30m:53s) from Gallagher on the trilogy and its historical moment; and perhaps most improbably, Roberto Rossellini in Texas�that is, footage from a 1970 appearance (13m:33s) at Rice University, discussing his work with faculty and students. With or without wartime recriminations, though, we see a Germany that is ravaged and nearly primitive, descending almost to a Hobbesian state of nature—citizens scavenge like vultures at the corpse of a collapsed horse in the street, for the hope of getting meat, for instance. The focus is on a little boy, Edmund, and on some level this is a coming-of-age story, but there's nothing innocent or nostalgic about anything in Edmund's world. His family has been forced into another family's home; his father is dying; his brother is ducking the authorities, because he fought the Allies to the last street corner, and now expects to be prosecuted. Is he a patriot? A war criminal? Rossellini won't judge for us, so we are on our own. You can see that the director has also gone to school on Fritz Lang, and learned the lessons of M in a subplot in which Edmund encounters a former teacher, who gropes him greedily and lustily before setting the boy to work in the black market, finding receptive customers for Hitler LPs. The portrayal of Edmund pushes us to the limit in our empathy for the vanquished; he does unspeakable things in the third act, and while it's too simplistic to say that the Reich robbed him of his innocence, there's certainly that suggestion in the final reel. It is an extraordinarily unsettling portrait of life after wartime. Extras include another French-language introduction from Rossellini—very strange to see an Italian director introducing his German film in French to the strains of April in Paris; also the original Italian credits and prologue (the feature is entirely in German). Carlo Lizzani provides a full-boat Rossellini biography (01h:05m:35s), looking at the director's life on screen and in the tabloids; Lizzani also offers his own reminiscences in a 1987 interview (23m:18s), especially interesting as he was the only Italian on an otherwise all-German crew. Signore Aprà is back again (12m:38s) for a project overview, and the Taviani brothers pay their respects as well (7m:52s). And in what's called a visual essay—really, just text interspersed with snapshots—Thomas Meder makes his case that this film owes a profound debt to Roswitha Meder, Rossellini's mistress during the war years.